Looking for a Premium Drinking Hydration Pocket Hip Flask for Camping, Wedding, Fishing, Hunting, Hiking? Congratulations you found it! 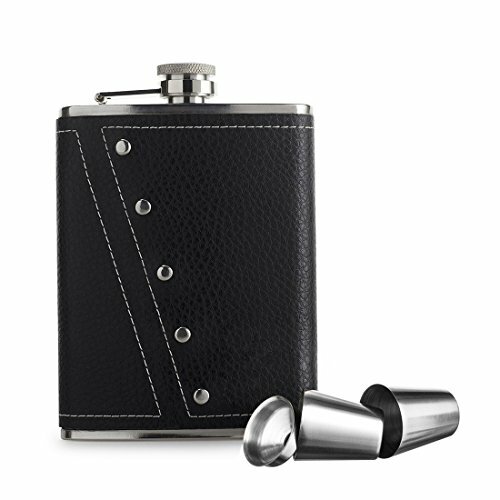 With this Premium Leather 18/8 304 stainless steel pocket flask you wont be disappointed! Made with pure high quality stainless steel and a stylish stitched leather cover makes it look really trendy! The leather also give a much more convenient non-slip grip and fits perfectly in your pocket, suit or jacket. If you are looking for a hip flask that will last a lifetime, you've found it. How many hours have you spent thinking of what gift to buy for husband, dad or boyfriend or just your friend? Our Hip Flask is the answer. Perfect as Birthday gift, fathers day, Groomsman or any kind of occasion. There is always a reason to have a Hip Flask at home. Imagine going to a wedding, party , bbq, golfing, fishing, camping , hunting or ANY kind of outdoor event! Keep your drink close! Cheers! Inside Package: 1x Pocket Hip Flask. Material: Stainless steel wrapped in leather. Color: Black Don't settle for anything less. Click the 'Add To Cart' button now to order your set today and then just fill it up with YOUR favorite liquor and enjoy. TOP GRADE MATERIALS - Classic standard 8 oz Hip Flask with FREE funnel included. The Flask and the Funnel are made of the finest 18/8 stainless steel and will never rust, fall apart, leak or let you down. 100 % LEAK PROOF TESTED - Every single Hip Flask are laser welded, air-pressured and quality controlled. The cap seals tightly to make sure no vodka, whiskey, bourbon or other favorite beverage will leak out and get wasted. CLASSY & VERSATILE - Wrapped in sleek high quality black leather, that gives you a safe firm grip while drinking from it or taking it up from your pocket or suit. A luxury Everyday Flask for weddings, camping, fishing, hunting, festivals, concerts and much more. PERFECT GIFT - Our Hip Flask is an ideal gift for young boys and older men on example birthday, Christmas, weddings, housewarming, graduation, fathers day and more. Or just order two now, one for you and one for your best friend. RISK FREE PURCHASE: Backed by our exclusive 1 Year Warranty and 90 Day Money Back Guarantee. You wont risk anything! Buy now before the price goes up. If you have any questions about this product by New Scale, contact us by completing and submitting the form below. If you are looking for a specif part number, please include it with your message. Liquor Flask by Laughing Leprechaun. Enjoy 8 oz. of Irish or Fireball Whiskey. Fits In Your Pocket or Purse. Stainless Steel with Attached Screw Down Cap.